Now we know the New Year is full of resolutions. Promises we make to ourselves and others as to what we will continue to do and not do. Will we become more organized? Exercise more? Eat healthier? 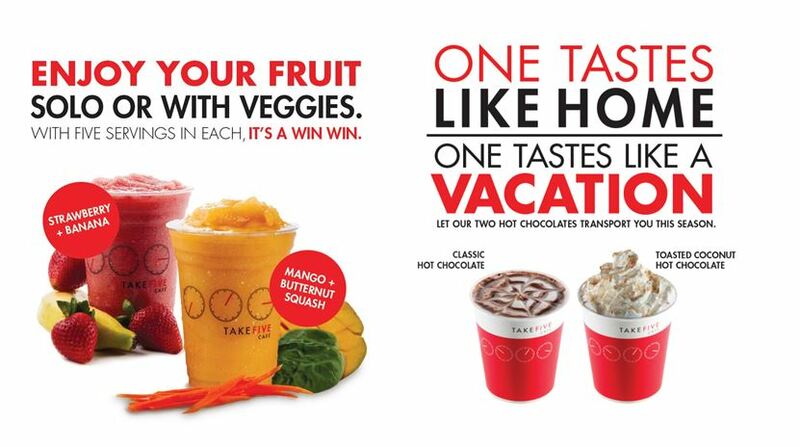 For those of you who are interested in a healthier approach we have our wonderful fruit + veggie smoothies. With 5 servings of fruit or 5 servings of fruit + veggies in every cup, it’s a win win either way. e between two – Classic Hot Chocolate or our new Toasted Coconut Hot Chocolate. The classic version is a reminder of the comforts of home – sitting in your favourite chair in front of a burning fire, while the other evokes the tastes of a Caribbean holiday with that added tropical touch. Wherever you hope to be on cold days this season, let one of our hot chocolates transport you! So for this new year and this new you, we’ve got you covered with lots of new choices. Here’s to a happy and healthy 2015!